I am giddy just thinking about my kids opening up their stockings on Christmas morning. I have always loved little gifts so opening up a stocking filled with trinkets that I needed or wanted was always a highlight of my childhood. 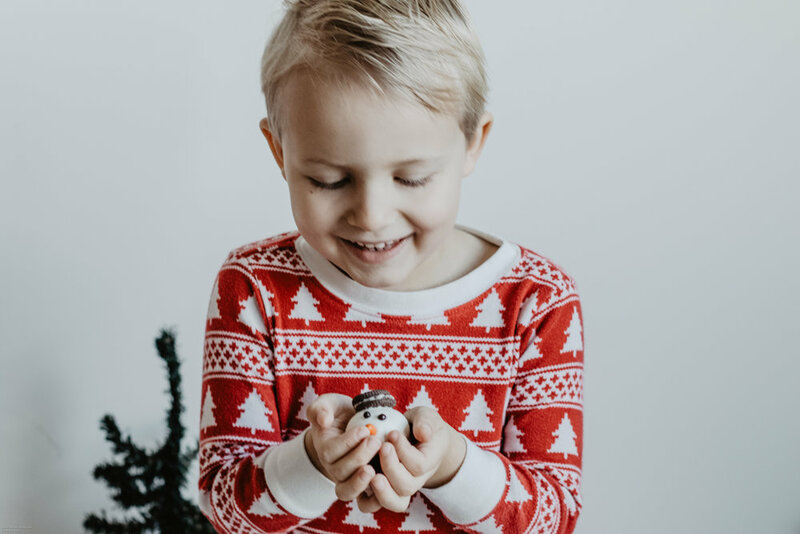 Sometimes filling a stocking can stump parents so today we are sharing some of our favourite companies and items to inspire you. 1. Growing up we always received "good chocolate" in our stocking. We always preferred quality over quantity so our mom would buy the best and sneak it in the toe of our stocking. I have been loving Rocky Mountain Chocolate and Jake especially loves their snowman bomb. Rocky Mountain Chocolate makes so many great little stocking stuffers such as chocolate trees with m and m's, chocolate gingerbread men, candy sticks dipped in chocolate and even mini holiday assortment chocolate boxes. 2. 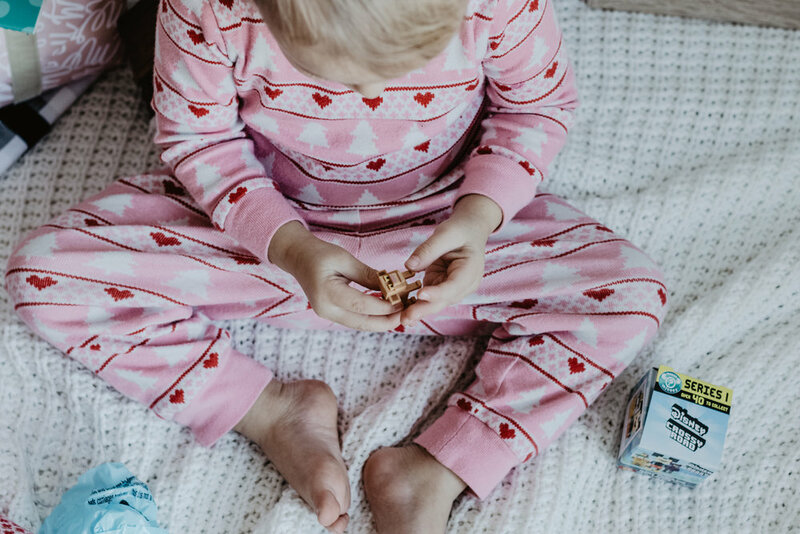 Kind Snacks - It is no secret we fell in love with Kind Snacks this year. I first found them at Target and now I see them at so many grocery stores locally, even Starbucks! Their chocolate nut and coconut granola bar is delicious and my kids love the Honey Nut and Sea salt. Their mini fruit bites bag in red (Cherry and Apple flavour) would make the perfect stocking stuffer treat and...no sugar! 3. Chronicle Books - Oh this is one of our favourite things to put in our kids' stockings! Of course we have our favourite books in our house but there is nothing like reading a new book especially on Christmas morning. 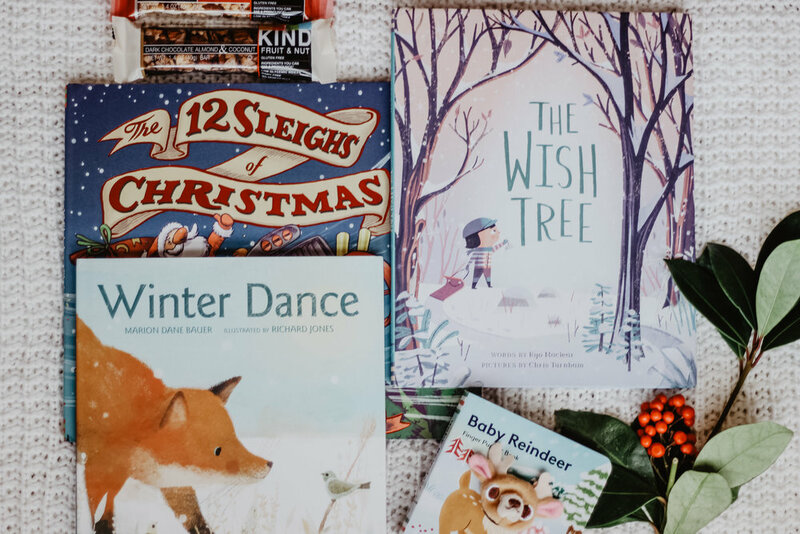 Chronicle books has all the new titles and we are think one of these books (The Wish Tree, The 12 Sleighs of Christmas, Baby Reindeer, etc.) would be excellent additions to any kid's stocking. 4. OOLY - Arts and crafts play a big role in our home and make an appearance almost daily. OOLY creates high quality products in a wide range that are age appropriate. These mini pocket pal notebooks are the perfect stocking stuffer and give children a place to be free to draw and write. The triangle coloured pencils come in a boxed case which makes clean up so easy for kids. However, my kids’ favourite item right now is their Itty Bitty Stickers - so many different themes and they are puffy!! Pick a few items in your child's age category, add a notebook and I know your kids will love creating. 5. Safari Toobs - Safari LTd. has created an entire collection of little animals and figurines for small hands to enjoy. They come in a long tube with a lid which makes them perfect to slide into a nice tall stocking. As a parent, what I love most about these figurines and animals is that each one is hand painted and because they are so small, I am constantly finding my children creating their own stories using their imagination and their TOOBS. Jake actually set up the nativity for me and I think it looks beautiful! There are so many other bigger animal figurines you can choose like crocodiles, deer etc. or themes for TOOBS such as On the Water, In the Sky, Baby Farm Animals, Antarctica etc. 6. Brio and Ravensburger - These two companies are known for their high quality children's products. I remember as a kid our mom worked at Kidz Biz (anyone remember that store) in Willowbrook Mall. Kidz Biz had a Brio train table and we loved visiting mom and playing with the trains. Brio builds toys that last a lifetime and I will always invest in a higher quality product that I know will last. This wooden fire truck makes sounds and lights up! Cairo will love it in his stocking and will have it for years to come (maybe even share with Ezri). For me, Ravensburger is most well known for their puzzles. Jake loves doing puzzles and I am thrilled to encourage him in that process. After we opened presents Christmas morning, my family used to do as many puzzles as we could all across our living room floor. A tradition that one day I hope to continue with my children. Jake's favourite puzzle is a Thomas the Train puzzle from Ravensburger and I know he will love putting together these Dr. Seuss' puzzles Christmas morning. 7. Calico Critters - This is one toy I wished I had as a child. Anything mini always gets my attention and these fuzzy little creatures and miniature furniture are nothing short of adorable! Kinsley is starting to create and set up her own little homes and I love watching her play "house". This year I am slipping in a nursery set, and this cute cat family! They have so many different animals including hedgehogs, twin babies, pandas, bears, puppies, bunnies, etc. and different sets such as children's bedroom, farmer's market and kitchen. You can add to your collection every year which is something I know we will be doing! 8. Bubble Bath - Our kids love bath time. Yesterday Kinsley asked for a bath at 9am! For me, the answer is always yes. My kids love bubbles in the bath and because they like to bath so frequently I need to be careful what brand of bubble bath I am using. 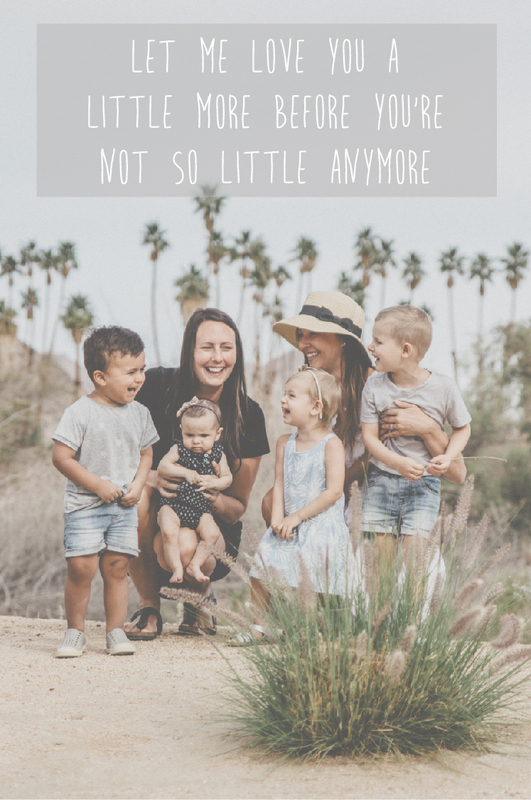 We have used Johnson and Johnson products since the the kids were born and the bubble bath is amazing. It always makes lots of big bubbles that last for awhile. So, we snuck in a bottle of bubble bath from Johnson and Johnson into both kids stockings this year! 9. Moose Toys - This is a fun one with any of you moms or dads with a great sense of humour. If you have little children I’m sure you've heard of Shopkins. Our friend Anna, had a huge collection in her room and would let Jake play with them every time we visited. They are tiny mini figures and you can collect from different themes and seasons. Well, the “boy" version is Grossery Gang. MY friend Laura bought these for a birthday gift and Jake was all over it! They are all different figurines but are spoiled grocery and gross items such as Foul Burger, Yuck Taco, Toxic Toilet etc - hilarious!! This little 2-pack comes in a grocery can and would slip into a stocking perfectly. 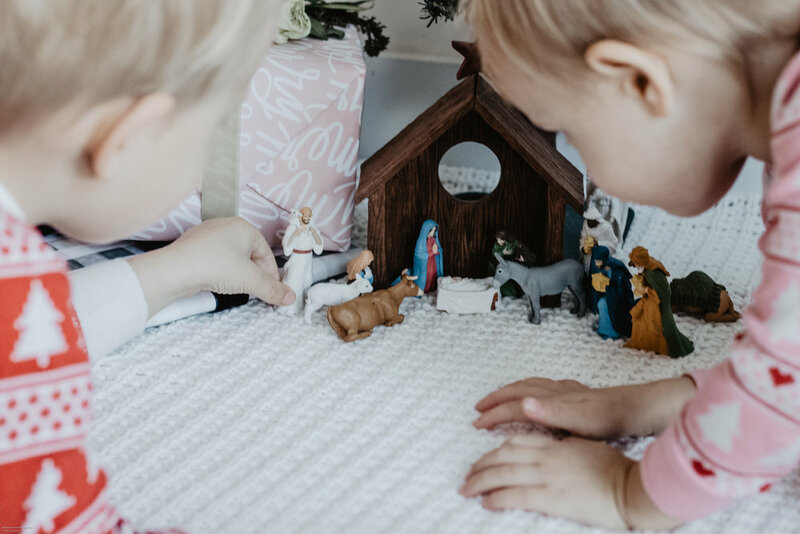 Can't wait to see what you fill your kids stockings with and hopefully this gave you a few fun ideas!